A Mercury-like planet the size of Earth orbits 100 times closer to its star, K2-229, than Earth does the sun. This newfound world could help shed light on the mysteries of Mercury's origins and evolution. It remains hotly debated why Mercury differs so much from its rocky siblings. Now, researchers have discovered an alien version of Mercury that could better explain the history of the solar system's innermost world. Scientists analyzed three planets orbiting an orange dwarf star designated K2-229 that is slightly cooler and smaller than the sun and is located about 339 light-years from Earth in the constellation of Virgo. They focused on K2-229 b, the world closest to K2-229, which orbits about 100 times closer to its star than Earth does the sun. K2-229 b's dayside temperatures can reach a scorching 3,737 degrees Fahrenheit (2,058 degrees Celsius), the researchers found. In comparison, Mercury, which orbits about 2.6 times closer to the sun than Earth, has daytime temperatures of only about 801 degrees F (427 degrees C). The interior structure of Mercury: A metallic core extends from the center throughout much of the planet. By analyzing K2-229 b when it passed in front of its star, the scientists found the planet was only about 1.165 times Earth's diameter. All in all, this exoplanet is about 60 percent denser than Earth. Assuming that K2-229 b has a metallic core like Earth's and the solar system's other rocky planets, the researchers estimated that its core probably makes up slightly more than two-thirds of the exoplanet's mass. This makes K2-229 b a cannonball planet like Mercury. "Almost all the low-mass small-sized planets detected to date showed compositions very similar to our Earth, and we started to think that Earth's bulk composition is the typical one and Mercury is the only exception," study co-author Vardan Adibekyan, an astronomer at the Institute of Astrophysics and Space Sciences in Porto, Portugal, told Space.com. "But now we see there are more exceptions, and if the number of such 'exceptions' increase, they will become typical." K2-229 b's likely metal-heavy nature contrasts strongly with its star's chemical makeup. This suggests that K2-229 b may have changed drastically over time, the researchers said. Perhaps its original crust and part of its mantle vaporized because of its extraordinary proximity to its star's heat and magnetic field, or perhaps it experienced a giant impact that ripped off a good portion of its outer layers, the scientists noted. The similarities between Mercury and K2-229 b suggest they might share a common history. 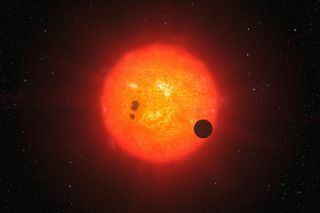 As such, the researchers said that learning more about K2-229 b could shed light on the formation and evolution of Mercury and other planets like it. "Our team and several other teams are working very hard to detect more systems like this, which will finally help us to draw a firm conclusion about the origin of Mercury and exo-Mercuries," Adibekyan said. The scientists detailed their findings online March 26 in the journal Nature Astronomy.